The opening guitar riff is definitely recognizable and was destined to become a classic. The song is timeless, evidenced by its resurgence in today’s movies and commercials. 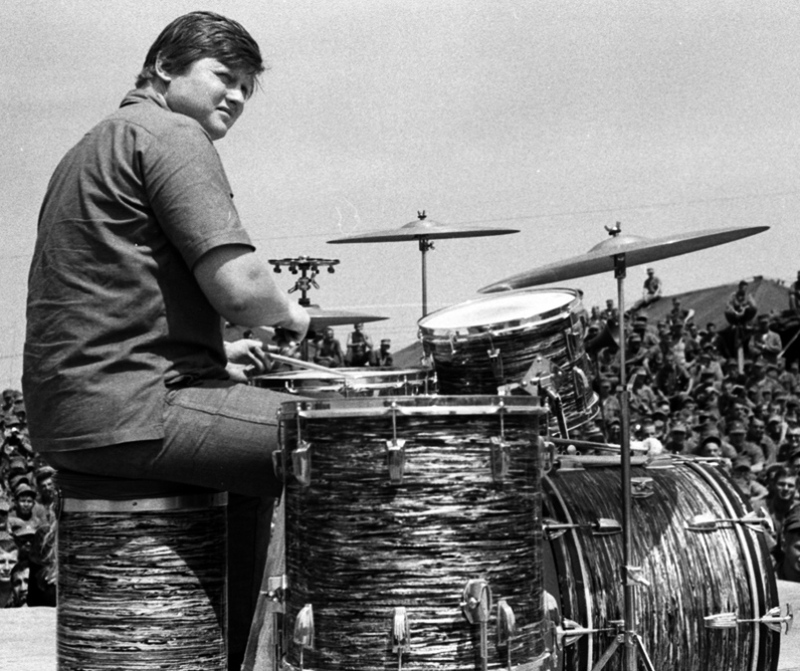 I had the pleasure of speaking to Mickey Jones regarding his role in recording this popular drum track. LSL: When and where was this song recorded? Mickey Jones: We recorded it in late 1965 at Western Studies in Los Angeles. LSL: Can you give us some background on this recording? MJ: We were on tour in England and our producer Lou Adler, one of the hottest record producers in the industry, was with us. Lou ran into another producer while were on tour that produced in England the TV show Danger Man. They were going to sell the show to CBS in America and retitle it Secret Agent Man. They needed a theme song and they loved Johnny Rivers. Lou said, “I think we can put it together”. We got back to the States and Lou got Phil (P.F.) Loan, who wrote “Eve of Destruction” and Steve Barri to write “Secret Agent Man” But unfortunately they only wrote one verse and one chorus – it was just for the opening theme of the new TV show. Disc jockeys started playing it as bumper music and we started getting requests to do it in the show. It was only 30 seconds long, so Lou Adler had this brilliant idea and took us back into the studio. We recorded this at Western Studios in Los Angeles with Bones Howe engineering. Lou brought in a couple of hundred people before our recording time and them we came in to do the recording – his idea was that he wanted it to sound live at the Whiskey a Go-Go because when the record came out, it was on one of the live Whiskey albums. So we had all these people in the studio and I’m not sure if we did the tracks and then they added the people or if the people we in another part of the studio and he was able to blend the live sounds, but it was not live at the club; it was just that he had a lot of people in the studio. He needed a couple more verses for the song so they went back and wrote follow-up verses. The song came out and it was definitely a Top 10 record. In retrospect, with Johnny River’s career, this was probably the largest record he had, and it’s poignant to me today because I still receive correspondence from drummers across the country regarding the record. To bring this to the present time, Chase Master Card used our original track in a major advertising campaign! I was really proud to be the drummer on that track. LSL: Your playing on that track was so muscular and groove-oriented. Were you allowed free rein to come with the parts for that song? MJ: Yes, and that’s just the way Johnny and Joe Osborne, the bass player, and I worked it out. That it; there is nobody else on that record. I was always a pretty percussive, hard player. I was known as the guy in town with the heaviest right foot. LSL: What kit did you use on that track? MJ: I used my Black Oyster Pearl Ludwigs. I bought them in 1961 when I was working with Trini Lopez, and I used them all around the world with him and with Johnny Rivers, Bob Dylan, and the First Edition. My set with Johnny Rivers was pretty basic – 14”x22” bass drum, 9”x13”ride tom, and two floor toms, 14”x14” and 16”x16”. My cymbals were Zildjian – 20” ride, 18” crash, and 15” hi hats. I sold that set to the Hard Rock Café chain, currently on display at the Hard Rock Café in Times Square, New York City. LSL: Do you have any closing comments about this song? 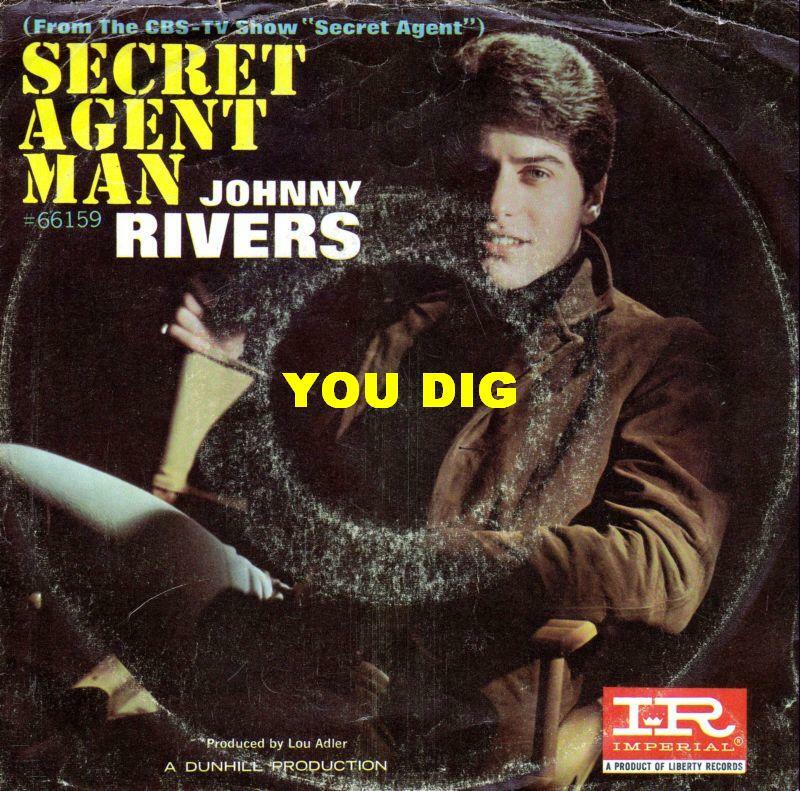 MJ: I think the defining track for Johnny Rivers is “Secret Agent Man.” I have to say that this song was probably the defining one for me with Johnny. When we had Johnny Rivers, Joe Osborne on bass, and me, this little trio made more music than anyone I’ve known. I’m honored to have been a part of musical history. Editor's note - Mickey Jones is known as the character actor's character actor. You've seen him on tv and in the movies. He also played drums with Trini Lopez, Kenny Rogers and the First Edition, and Bob Dylan.